Adobe Photoshop is a raster graphics editor and one of the first applications of its type on the market. Through time it had different names and ended up with the Photoshop one after the 2003 Creative Suite re-branding decision. The application is both available on Windows and Mac OS with extended support and also has an express web based version for freeware editing. The PSD file format is the application's native file extension, it is capable of multiple layers and it is limited to 30000 pixels width/height. The format is also supported by most of its competing software applications with or without importing filters necessary. The PSD file can contain imaging options like masks, colors, text, duo-tone etc. and supports RGB, CMYK, grayscale, monochrome, duotone and multichannel modes for the colors. Even if the file can be opened by other similar market oriented programs it is still proprietary to Adobe so working with the file type on a daily basis especially on projects involving team work and collaboration can be proven quite challenging. This is where a format known for its portability and archiving properties like PDF can become very handy at times. 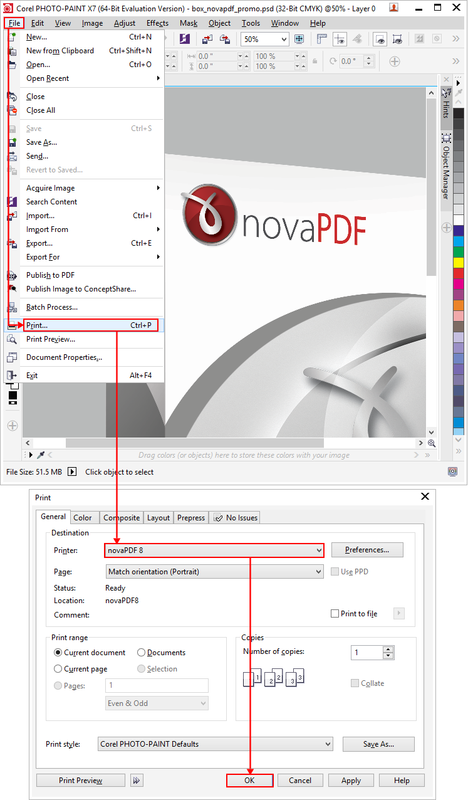 Also novaPDF with its unique features can help a great deal in improving the converted documents (add annotations, overlay, merge multiple PDF, sing the files and more). 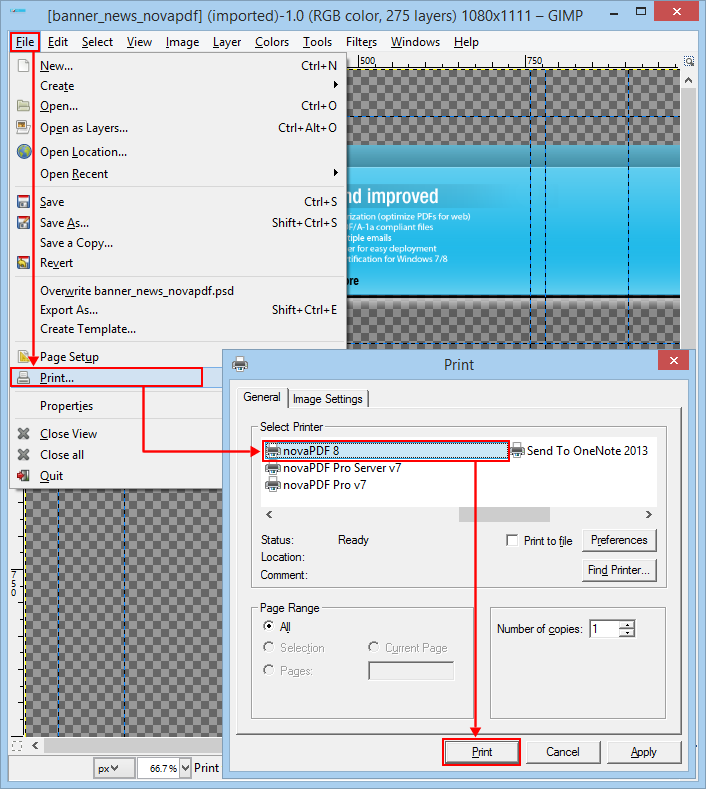 In the Save PDF File As window select after save actions and click OK to convert the file. Click on OK and in the Save PDF File As window click OK again to start the file conversion (you can click on Print Preview to see how the resulting file will look like). 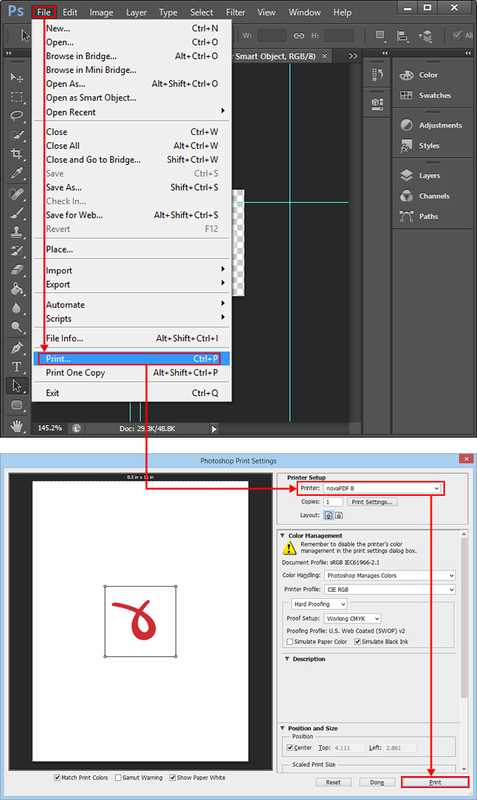 Gimp is the only open source program capable of opening the PSD format. In the Print windows select novaPDF from the Select Printer list. You can change additional image printing options by visiting the Image Settings tab, and when you are ready click on Print then OK. The PDF will be created afterwards.